﻿For you. The first gift of the year from MommyMaestra. I hope you enjoy these bilingual number cards and posters. I've mentioned before that we are using a lot more manipulatives in our lessons. I designed and cut out these cards then laminated them. I'm using them with my Kindergartner during his math lessons, but my 2nd grader is benefiting from them, too, in her spelling lessons. You can punch holes in the top corners of each card and place them on a ring (as I have), or run some ribbon through them to create a banner. I have the number poster displayed in a frame, but it could also be easily laminated and placed on a wall, etc. 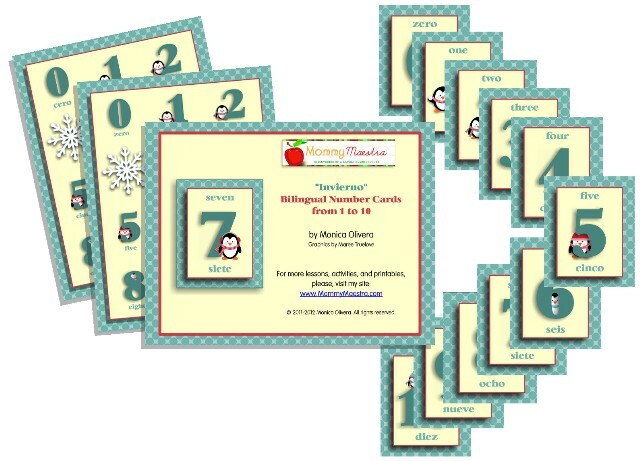 If you are teaching your children Spanish, you could also use these cards to teach them the numbers from 1 to 10. To download this set, just click on the picture above. I hope 2012 is starting off on a good note for all of you!